Jared Unzipped: Halloween Light Shows! If there's one thing I enjoy during the Halloween season, it's watching videos of homes decorated with lights synced to music. The effort these homeowners put into lavishing their abodes with millions of lights is insane to say the least. Yet, I appreciate their hard work for the fine detail just as much, if not more. Not just anyone could compose a perfectly choreographed masterpiece on the front of their house. The ghosts, jack-o-lanterns and chatty demon faces are quite the novelty and certainly interesting to watch. 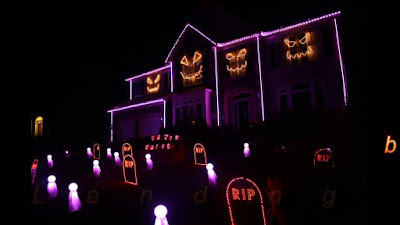 I thought I'd share some of my favorite Halloween light shows with you. Enjoy!